Often times the best wedding day portraits can be sparked by simply placing the bride and groom in a good spot, and just letting them be themselves for a few minutes as you photograph them from afar. 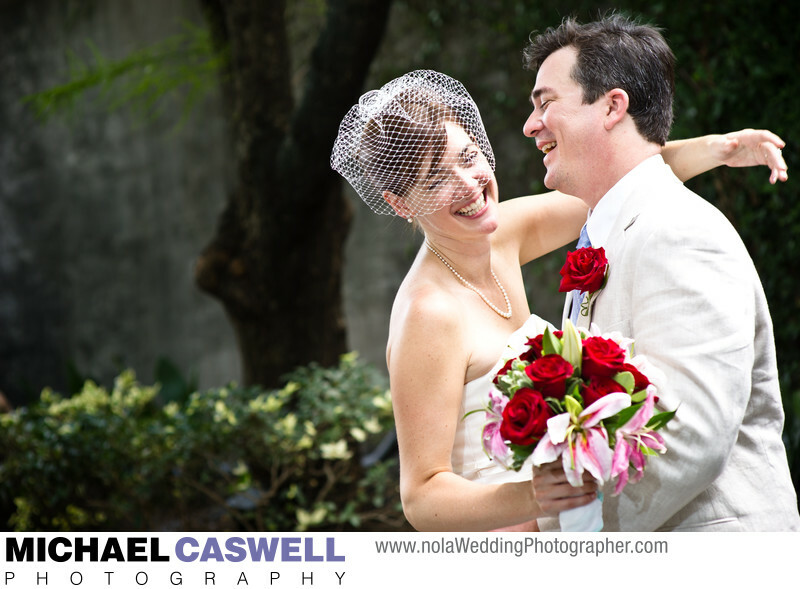 Such was the case with this newly married couple who had just exchanged vows at the venue formerly known as Galvez (now reopened as Marché) in the French Quarter right by the Mississippi River. We snuck out for a little while for some portraits in the alley that runs between the Dutch Alley area where the venue is, and Cafe Du Monde. It would be exceedingly difficult for a couple to, on request from the photographer, simply create these kinds of natural expressions instantly and on-demand. Perhaps professional models can generate the appearance of this kind of moment when required, but for the rest of us, unless it's a traditional "look straight at the camera and smile" pose, it would feel very awkward to follow instructions on exactly how to stand and move, what facial expressions to make, how to look at each other, and so on. And, of course, it would be fake and artificial, which is perfectly fine for a photo used in an advertisement, but not ideal for a wedding photograph. While some degree of guidance from the photographer is usually necessary, my goal is to capture the couple's true emotions and personalities, which I accomplish by, for some of the pictures, asking them to simply be themselves and pretend like I'm not there.